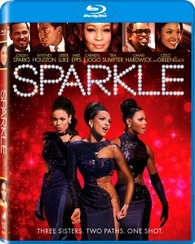 Overview - Sparkle is a timeless story of the bonds of family, the trials of success and the power of music. In her feature film debut, "American Idol" sensation Jordin Sparks stars as Sparkle, a young woman whose big dreams seem almost impossible. She's been warned against the pitfalls of the music industry by her protective mother (Houston), yet encouraged by the handsome and ambitious Stix (Derek Luke), Sparkle forms a trio with her sisters (Tika Sumpter and Carmen Ejogo). Together, they perform the soul-stirring songs that Sparkle pens. But as their fame grows, so do the risks of jealousy, self-doubt and insidious temptation. A sweeping drama is brought to life with a powerful cast including Mike Epps, Omari Hardwick and CeeLo Green. "A Tribute to Whitney Houston"
Like any self-respecting (or perhaps self-loathing) movie critic, I can never resist an easy opportunity to "cleverly" work a film's title into my own critique. With that in mind, I wanted nothing more than to be able to start this review by simply stating: 'Sparkle' sparkles! Unfortunately, I can't. A clichéd, melodramatic, and formulaic musical drama, the film lacks consistent direction and scripting, resulting in forced histrionics, affected performances, and an uneven tone. The potential for a decent flick is here, but the execution just leaves too much to be desired. Sparkle (Jordin Sparks) is an aspiring songwriter and performer who dreams of making it big in Detroit during the late sixties. She lives with her strict mother (Whitney Houston) and two siblings, Dolores (Tika Sumpter) and the appropriately named Sister (Carmen Ejogo), who all happen to be first class singers in their own right. Through the advice and guidance of Sparkle's boyfriend/manager Stix (Derek Luke), the three sisters form a musical group and soon rise toward the cusp of fame. Just as things are looking great for the trio, drugs and domestic abuse take their toll on Sister, placing the family's future in jeopardy. With her dream on the brink of disaster, Sparkle will have to find a way to overcome the obstacles in her path in order to reach stardom. Though a remake of the 1976 film of the same name (which I haven't seen), the script also bears pretty heavy similarities to just about every other story that deals with aspiring musicians dreaming of success. This in itself isn't a bad thing, but the familiar plotting fails to ever carve an identity of its own. Despite a few rather dark detours here and there, the standard dramatic beats all lead to a very predictable path, and the characters are all extremely clichéd and one-note. Sparkle is your basic good-natured young woman with a lot of talent that has to ultimately come out of her shell to assert herself. Sister's arc reveals a tried-and-true cautionary tale about domestic abuse and drug addiction (and of course, there's a classic jealous boyfriend subplot thrown in there too). Their mother, Emma, stands in as the requisite domineering, disapproving figure. She's felt the sting of failure before and doesn't want her daughters to go down the same road. Any of that sound familiar? Yeah, I thought so. Really, all of the characters fit into similar unoriginal archetypes, and none of them ever rise above their stock personalities. In the script's defense, there are genuine attempts at tackling deeper themes dealing with the allure of fame, the drive toward success, the pitfalls of abuse, and the importance of family, but the screenplay lacks any semblance of subtlety or finesse. Instead, the drama all feels forced, basic, unrefined, and quite over-the-top. Likewise, there are some silly contrivances and inconsistencies, and a few subplots seem to fall by the wayside (Sister's jilted ex-boyfriend, for instance). The group does face some weighty obstacles down the line, but their rise toward stardom seems rather easy. Seriously, one night they just hop on stage, sing and dance around in short dresses, and after a quick montage of similar gigs, they're suddenly opening for Aretha Franklin. To counteract this seemingly effortless climb to the top, the script takes on a few surprisingly dark turns, but these instances are out of place and overbearing. Though perfectly serviceable, the direction also features a similarly superficial scope, and the whole affair ends up feeling pretty melodramatic. The acting is decent at times, but the entire ensemble suffers from stagy performances that could have benefited from being honed in and refined. Again, the potential for good work is here, but the direction and writing feel inexperienced, leading to an uneven, unassured tone. Moments that could have had emotional resonance are instead marred by a histrionic air that gives the proceedings an artificial, hollow quality that lacks substantial subtext. It's clear that the actors are giving it their all, but most of their efforts are sadly in vain due to lackluster directing and a mediocre script. On the plus side, the movie's musical performances are all top-notch. Jordin Sparks and Carmen Ejogo are particularly impressive, but all three sisters really sell their talent. The songs (written by Curtis Mayfield and R. Kelly) are catchy and evoke the time period fairly well, and the costumes and choreography are great. The late Whitney Houston also gets a number all her own, and as expected she does a lovely job (making one wish she got to sing more). Hell, we're even treated to a Cee-Lo Green performance during the film's opening sequence. He plays a musician named Black, and despite only appearing in the movie for about two minutes, his silly, grinning face gets stuck on the cover along with the movie's actual stars. With an unoriginal script (even for a remake), basic direction, and clichéd characters, 'Sparkle' is a sadly forgettable effort. The drama is a bit cheesy, shallow, and forced, and to be perfectly honest, the whole affair feels more like a made for VH1 movie than a legitimate theatrical release. There is some value in the flick's musical performances, but they can't save the film from its otherwise lofty flaws. Upon its initial run, the movie actually received a decent amount of positive reviews, but I'm just not seeing a whole lot to praise here. With that said, this is a perfectly harmless effort, and its ultimately positive message about following one's dreams might prove worthwhile to some. Fans of the original and those who admire similar tales about aspiring musicians may want to give this a rent. All others, however, will likely want to skip it. Sony brings 'Sparkle' to Blu-ray on a BD-50 disc packaged in a keepcase with a cardboard slipcover. While the movie itself might fail to dazzle, the packaging actually does sparkle. Literally. An insert with instructions for a downloadable UltraViolet digital copy is included. After some skippable trailers the disc transitions to a standard menu. The packaging indicates that the release is region A coded. The movie is provided with a 1080p/AVC MPEG-4 transfer in the 2.40:1 aspect ratio. Crisp and clean, the transfer is free of any major issues and does a very nice job of showing off the film's glittery production design. Shot digitally in high definition, the source is pristine with virtually no artifacts or noise to speak of. The image is relatively sharp with a strong sense of detail, revealing many fine textures and intricate patterns in the characters' numerous extravagant costumes. Bold blues and purples bathe many of the striking musical numbers in soulful hues, and a golden glaze cascades over many of the daytime scenes. With that said, several indoor sequences look a little dim and dull. Thankfully, there are many vibrant splashes of color in the performers' wardrobe choices that add nice variety, and their sparkling sequin dresses pop brightly from the screen. White levels are well balanced throughout, and blacks are inky and consistent. 'Sparkle' comes to Blu-ray with a very pleasing transfer. A few scenes look a tad dim and drab, but the late 60s production design and beautiful costumes shine through. The audio is presented in an English DTS-HD MA 5.1 track, and French and Thai Dolby Digital 5.1 tracks. Optional English, English SDH, French, Chinese, Korean, and Thai subtitles are also included. Fueled by some strong musical performances, the mix sounds fantastic, creating a full, deep soundfield. Dialogue and vocals are clean and clear throughout. The Motown songs come through with great fidelity and separation, sending isolated and disperse cues throughout the room. Audience cheers, catcalls, and applause all hit the rears, offering a great sense of ambiance that does a nice job of replicating the nightclub atmosphere. Effects outside of the various songs are also solid, with specific sounds (like falling rain) being spread around directionally when appropriate. Dynamics are wide and free of any distortion, leading to an exceptionally crisp and spacious sound with impressive high and mid-range frequencies. Bass activity is deep and precise, lending the track some nice kick. Balance between all of the audio elements is handled well, and transitions from dialogue scenes to musical performances are smooth and natural. While it's not quite worthy of a perfect score, the mix sounds great. The film's musical performances are a real highlight, and all the songs come through with wonderful auditory range and texture. Sony has provided a decent assortment of supplements, including a commentary and several featurettes. All of the extras are presented in 1080p with Dolby Digital 2.0 sound and English and Thai subtitles (unless noted otherwise). Director's Commentary - Director/Producer Salim Akil offers a subdued and fairly uneventful commentary. The director provides some details on casting and locations, but spends too much time merely complimenting the performers while pointing out aspects of the production that he likes. There are some occasional insights into the movie's themes, characters, and examination of domestic abuse, but by and large the discussion is rather light on interesting observations. Likewise, there are numerous pauses and gaps in the commentary, leading to a pretty lackluster and skippable track. A Dream Come True (HD, 18 min) - This featurette traces the movie's production and lengthy development. Interviews with the cast and crew offer insights into the various false starts that plagued the project, as well as details on the characters, scripting, and changes from the original 1976 film. A Tribute to Whitney Houston (HD, 20 min) - Here, the cast and crew reminisce about the late Whitney Houston and share stories about what it was like to work with her. 'Sparkle' is a clichéd, uneven, and occasionally pedestrian musical drama that never finds a truly assured tone. The scripting is basic and familiar, and the whole affair lacks subtlety and nuance. The songs are well done, but everything else is sadly lacking. Thankfully, the video transfer and audio mix are great. Supplements offer a few decent insights into the film's long development as well as a solid tribute to Whitney Houston. I didn't find a whole lot to admire about the movie, but the music and performances have some merit. This is a rental at best.